We make all our wine in our unique patent-pending GOfermentor. This device uses a disposable flexible liner inside a rigid outer support container. The liner has two chambers – the primary chamber contains the grape must being fermented, and the secondary chamber is used for pressing the primary chamber. In red wine the fermentation contains the skins and seeds, and as the fermentation progresses, the skins and seed form a a mass that rises to the top. This is called the “cap” and it must be periodically pushed down to keep it moist and to extract color and flavor into the wine. This operation is termed “cap management”. In the old days this was done by foot stomping! This entire operation is done automatically in the GOfermentor by periodically inflating the secondary chamber with air. This causes the primary chamber to get squeezed, pushing liquid up to wet the cap and also breaking it up. The sequence is illustrated in the video on this page. At the end of fermentation, the wine must be separated from the spent skins and seeds (pomace). This is called pressing. Typically, this is done by pumping the contents of the fermentor to a wine press. Pressing is a messy and labor-intensive operation. 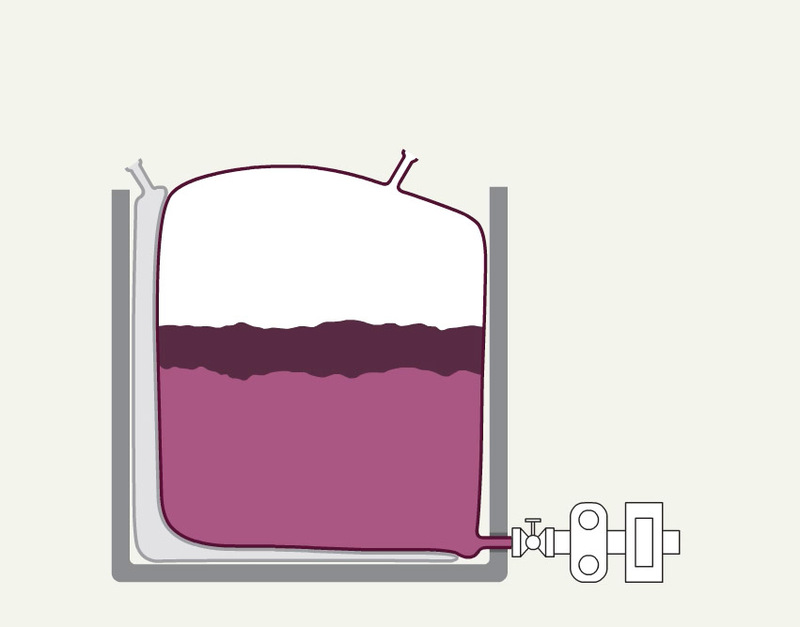 With the GOfermentor however, no press is needed – the secondary chamber is simply inflated which forces the wine in the primary chamber through a strainer to be collected for aging. The liner with spent pomace is taken to the vineyard where it is spread as organic fertilizer and the empty liner discarded. No cleaning. No water used. 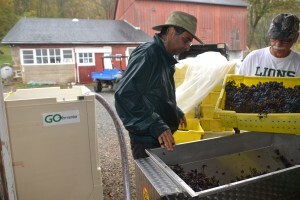 The GOfermentor was mainly designed for red wine production where cap management and pressing are important operations. It has however, also been used successfully for making white wine. Here the grape juice is pressed out before the fermentation. While cap management is not an issue with white wine, the labor saving operation and elimination of wash water also makes the GOfermentor an excellent device for white wine. The GOfermentor has its own website with lots of technical details. Check www.GOfermenter.com out for the latest on this innovative technology.